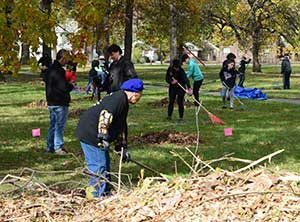 Project EverGreen, in collaboration with local business partners, community groups and the city of Detroit, began transforming Detroit’s Pingree Park by planting trees, improving grass play areas and painting backdrops. “This is the boost we needed to help return Pingree to its former glory. Our kids and grandkids grew up here. I’m just so happy,” said Minnie Knox, a 50-year resident of the neighborhood. The renewal of the 18-acre park began Nov. 3-4 with about 200 volunteers taking part in the project. More than just an aesthetic makeover, the project represents the revival of a community hub that serves as a gathering area for generations of east side Detroit residents and new families moving into the Pingree Park neighborhood, according to Project EverGreen. The renovation is also meant to spark nearby development and provide increased safety for kids playing on the grass sports fields, Project EverGreen said. Plans for the second phase of the project call for creating new walking paths, building a grass amphitheater and planting new trees on East Forest Avenue. These updates are scheduled to take place in the spring of 2018. Presenting sponsors include Magna International, which contributed $100,000 to the project, and Lear Corporation. Click here for a full list of supporting and food sponsors.